Wouldn't you love an entire sheet set made out of your favorite t-shirt? 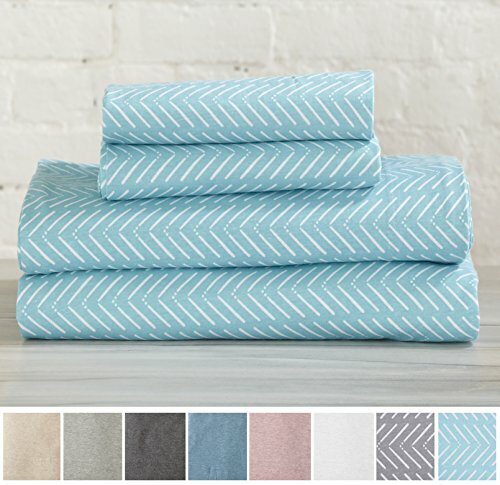 Our extra soft and cozy jersey knit sheets are just what you need! These lightweight, flexible, breathable sheets are ideal for any season, so you can sleep comfortably in them year round. They make a perfect gift for birthdays, weddings, Christmas, holidays and more. - 90% cotton, 10% polyester material - feels just like your favorite t-shirt! - 150 GSM fabric is suitable for all seasons. Stay warm and cozy without getting too hot. Choose from Rose Quartz, Winter White, Chevron Grey, Chevron Tan or Chevron Blue. Machine washable, durable and long lasting. They just get better with every wash! If you don't absolutely love these sheets, return them within 30 days for a full refund. We'll work with you to resolve any issue and ensure that you're satisfied with your experience. Recognized as a top product for excellent reviews, low return rates and fast shipping! EXTRA SOFT AND COZY: These affordable jersey knit sheets feel just like your favorite t-shirt. The 90% cotton and 10% polyester fabric is WARM, SOFT, FLEXIBLE, and BREATHABLE for maximum sleep comfort. Perfect for any room in your home, including bedroom, guest room, vacation home, RV and more. Each set comes with 1 fitted sheet, 1 flat sheet and 2 pillowcases (1 for Twin XL size). Choose from a variety of beautiful fade resistant colors. ALL-SEASON COMFORT: 150 GSM fabric is perfect for any time of the year. Lightweight enough for the summer, and cozy enough for the winter. PERFECT FIT EVERY TIME: These DEEP POCKET sheets fit mattresses up to 17 inches deep, with a fully elasticized fitted sheet. They're available in Twin XL, Full, Queen and California King sizes to fit any bed. See below for exact measurements. EASY CARE: Machine washable for your convenience. Long-lasting, durable and better with every wash! 3D Rose Name Initial Letter T-Monogrammed Grey Quatrefoil Pattern-Personalized Yellow Gray Design Pillowcase, 16" x 16"